Welcome to another installment of What I Ate Today! In this post, I will share with you how I eat simply during the day and then have a delicious feast for dinner. My eating is not always like that, but Marty and I typically like to eat a bigger dinner and fuel on fruit and veggies during the day. As I mentioned in my post on tips for vegan beginners, smoothies are key! This morning, I added pineapple, mango and blueberries into the blender. Then I just added coconut water. Prior to this I had two big glasses of water with lemon. I find that when I do this, I eat breakfast a little later and hydrate my body properly before I work out (if I do so in the morning). I also seem to crave less food in general when I start with a lot of water. For lunch, I was craving beans. Beans and legumes are a great source of protein. They are actually a great source of a lot of things as these little bit sized balls of deliciousness are packed with fiber, antioxidants, iron, zinc and potassium. I cooked a can and drained some of the water out. Then I boiled some frozen broccoli. Combine the two with some salt, pepper and garlic powder and you have a wonderful and nutritious lunch. My snacks are usually the same so I’ll just list a few I like. Plums, berries, almonds, walnuts, dried figs, DATES, bananas, celery with peanut butter or hummus. Before I share this Vegan Chipotle Slaw Taco recipe, I would like to make a disclaimer. Meat substitutes for vegans are usually made out of soy. I, personally, limit my intake of soy as soy contains phytoestrogens. Phytoestrogens are plant based estrogens that mimic this hormone in our bodies. * When I learned of this, I decided I didn’t want to include this in my diet everyday. At the time, I was eating a lot of tofu. There are a lot of meat substitutes out there that taste amazing and I am not saying they are all bad. I just wanted to note that I have personally decided to limit my intake of soy products, like the meatless meatballs I am going to feature in the recipe. However, this was a special occasion and a damn good recipe. First, I made a chipotle vegan cole slaw. (I don’t have any measurement tools yet so I can’t give you the proper amounts that I used. Just eye ball it.) I started by chopping up an entire head of cabbage and peeling about 5 or 6 carrots. You are suppose to grate the carrots after peeling them, but since I don’t have a grater I just continued to peel them into fat slices. Then I chopped them up and mixed them in with the cabbage. Mix it well and then combine with your carrots and cabbage. Vegan cole slaw with a kick! This will serve as the topping for the tacos. To prepare the “meat,” I thawed out Trader Joe’s Meatless Meatballs, until they weren’t frozen anymore. Heating a skillet on medium, with some olive oil, I tossed in the meatballs. After they had time to warm, I broke them into pieces with a spatula. Now that you have your taco “meat” and cole slaw, it’s time to assemble onto the tortilla! I added diced tomatoes and sriacha for some more spice! As delicious as these were on their own, Marty and I concluded that they were missing some creaminess. Marty suggests adding some avocado, blended with cilantro. This will give the dish some more texture and cool down your palette. I would also add that if you wanted this to be a lighter, or gluten free dinner, simply make this a taco bowl instead, minus the tortilla! Enjoy! I feel inspired to share this story with you. It’s connected to a number of reasons as to why I moved to California, (if you haven’t already, you can read part one here) but it also touches on a subject I want to discuss. Mental and emotional health. Your body and your mind are connected. To me, veganism and clean eating, isn’t just about losing weight or making your outer body look good. To me, by taking care of your insides, you are taking care of your soul. Apart from wanting a change and seeking a place that would allow my plant based lifestyle to be simpler, a job I had prompted my departure. I had been working in restaurants the entire time I was in college. It’s fast money, flexible with my class schedule, and I was good at it. I like people and they like me. Once I finished college, I felt pressured to find a “real” job, a phrase I heard and said countless times. The general attitude towards waitressing jobs in Massachusetts is that it’s a job you have before you move on to something else. It’s seen as temporary. Even though the job is hard work and requires a number of skills such as a great memory, multi-tasking, friendliness, patience, strength, stamina…I believe that if you can be a waitress, you can do anything. But for someone like me, who has a degree, I was expected, by most, to be using it right away. I have a Bachelors degree in English, and I couldn’t be prouder of it. I worked really hard in college and I enjoyed every minute of it. I made great friends, developed close relationships with brilliant professors and wrote as best as I could. I presented at conferences, received grants for my work and graduated as part of the honors program. I was devastated when it all ended and I still look back fondly at the time I spent as an undergrad. I think this is what made my transition harder into the “real world.” I received a lot of praise and confidence boosts in school. But now that it was over, I was expected to make money and use my degree in some way. It wasn’t enough that I had an education,that I had expanded my mind. I had to DO SOMETHING now. My cousin works for a health insurance company and he told me there were some open positions for member service positions. The thought of sitting in a cubicle, in front of a computer screen, with a phone attached to my ear sounded like hell. But I needed money, I needed to start somewhere. I applied and got the job. There was an eight week training program involved, for us to learn the ins and outs of the health industry and to understand insurance so we could answer member’s questions. The first few weeks of training involved sitting in a class room from 8:30 until 5, going over power points and taking tests. Learning. I learned that America is run by the drug industry. I learned that the majority of our society is on medication. I learned that people call their doctors over the slightest ailment and immediately gobble up every pill that is prescribed to them. I learned that doctors get paid to give out prescriptions. Healthy alternatives, like supplements or herbal remedies, are not covered by Massachusetts health insurance because holistic medicine is not viewed as a valid form of health care. I learned that by keeping America hooked on medication, a billion dollar industry is flourishing and the American people are slowly dying. I thought about quitting almost everyday. My energy was low, my mind tired. I felt exhausted after leaving each night, even though I had been sitting all day. As a happy, lively woman these feeling were new to me and I was confused as to why they were occurring. But I stayed because of the money. Finally my healthy, receptive body found a way to speak to me. A week before my training ended and I would be able to be a real member’s service rep, I started to feel sick. Sitting in the back of the class room, I suddenly became really cold. I looked down at my hands and they were shaking. My heart began to race and my cheeks grew hot. I thought I was getting a fever. What else could explain this. When we breaked for lunch, I told one of the trainers that I needed to go home. We weren’t allowed to miss any training days or leave early, some of my co-workers had been asked to leave the training program for this, but I didn’t care. I knew something was wrong. I had to put my things away on the fourth floor before I could go home so I began walking up the stairs. My heart started racing like never before and my mind seemed to be spinning. I thought I was going to faint. Once I finally made it out of there, I did the mature 25 year thing and called my mother. “It sounds like you just had an anxiety attack, ” she said. I don’t have anxiety. I get a little anxious at times, or worked up about things, but I would never consider myself an anxious person. “You have been saying you wanted to quit, looks like your body went ahead and made the move for you,” my wise mother replied. And she was right. I quit the next day. I thanked them for the opportunity, because I did appreciate the job offer, but I told them it wasn’t for me. I went back to working at the restaurant I had been for the last few years. I’m telling this story because I think that mindfulness and your well being is equally as important to being a vegan as the food you put into your body. You have the right to make decisions for yourself and your body. I felt stuck being indoors, staring at a computer screen. Sitting all day, no circulation, waiting for my next break…that is not how human beings are meant to live. We are meant to be active, breathe fresh air and in touch with nature. We are meant to live in a way that is nourishing to our souls. Being in that office, breathing the stale air, listening to lectures on the corrupt medical industry (only it was feed to me as the countries way of helping its citizens) I felt like a caged bird. Think about what you really want. Listen to your body. Sometimes our constant ailments are our bodies cry for help. Most of the time, it is telling you what to do or what to stop doing. We just ignore it too often. I couldn’t find a job in Massachusetts that catered to what I needed so I left. I understand that not everyone can do what I did. And I’m not saying that every office job is bad. I just want people to open their hearts and minds. Don’t follow the person in front of you, or this “system” in which we are suppose to live our lives. Live your life for you. Live your life for your health, for your body, for your glorious and wonderful mind. Don’t let a thing that precious go to waste. As I have mentioned before, I am relatively new to this lifestyle. (And I will never lose my passion!) I’ve been receiving some questions about how to get started soI am creating this easy to read breakdown of what has helped me. I collaborated with my boyfriend, Marty, to compile this list since he has been vegan longer than I have and he always gives me great advice! So without further ado, here are our suggestions for vegan newbies! I can’t stress this enough. Changing your eating habits is a huge life change and you don’t want to get discouraged. Be mindful of the foods you like to eat that are plant based and focus your meals around that. If you only know how to make one vegan dish, eat that everyday. If you love bananas, put plenty of them in smoothies or eat them throughout the day. If you love beans, there are a millions way to cook those. Start slow and begin weeding out the meat and dairy along the way. If you are like us, you love eating. I plan what I’m going to make for dinner, while I’m eating lunch. It’s just how my brain works, especially now that I have been cooking all my own food. I think about what will taste good together, what type of spices I will use, if I want to make my meal entirely raw or add some cooked elements… Food is on my mind a lot. With that being said, it is easier for me to get excited about my vegan food because I know it’s going to taste delicious. This may seem obvious, but it really is key to keeping up with this life style. You need to have enthusiasm for your meals to counter your cravings for foods you are use to eating. So make it as scrumptious as you can! There are so many more vegan options popping up everywhere so your possibilities are endless. This goes hand in hand with enthusiasm. Once you learn about what you are putting into your body, all the nutrients and vitamins you are feeding it, you will know the reward for all your hard work. I know that when I’m putting a handful of blueberries into my smoothie, I am also filling my body with antioxidants, therefore neutralizing and removing free radicals from my blood stream. Spinach is not my favorite green, but while I eat it I am thankful for the zinc I am receiving. The food you put in your mouth effects your entire body and a lot of times we only focus on our taste buds. Researching how and why and when is extremely motivational AND gets you more in touch with your own body and what it needs. I love smoothies! I drink one every morning and every morning it is slightly different. I look forward to this source of energy to start my day. For vegan beginners, it’s a great way to get your fruits and veggies in. A typical smoothie for me includes frozen banana, frozen kale and whatever else we have fresh or in the frozen, such as blueberries, mango, pineapple or more bananas. Add a scoop of barley grass powder and pour in almond milk, coconut water or just regular water and BAM! You have a lot going on and odds are it’s going to taste delicious. There are so many foods or supplements (if you are taking any) that you can toss into the blender for an amazing meal. People are putting chemicals into their bodies on a regular basis. Animal-derived products, like dairy, meat and eggs are also on the high risk end because of the GMOs present in the animal feed. This is a huge reason as to why animal products are unsafe and harmful to our bodies. As a vegan, knowing these facts can only help you. Try avoiding any fruits and veggies that aren’t organic. Mindfulness is a huge part of veganism. Embrace yours. You don’t want to let yourself get too hungry when you are changing your diet. You will crave your old eating habits a great deal. Packing snacks works for me, because if I ever do start to have a craving, I can counter act it with the watermelon I have in the back seat. On a recent trip to San Diego, Marty and I packed a bunch of bananas, some almonds and a watermelon, which we split. Since we both love food, a day out with restaurants on every corner use to be a form of unusual punishment. Now, we know we already have plenty to eat and that we will feel even more energized and happy with the choices we have brought. And it saves money! Set yourself up for success and plan ahead. You will be so happy you did. It’s nice to indulge in “meatless” chicken or meatballs, frozen vegan mac and cheese or tofu scramble every once and awhile. But only whole foods are going to leave you feeling satiated and satisfied long term. If you are trying to lose weight, this is especially important because processed food can contain added sugars and can become addictive. Then you will crave more processed food, which in turn makes you eat more. This is another great reason to cook your own food. Put the work in and you will be proud that you created something that will benefit your body. Self love goes hand in hand with veganism. You are making great strides in your life to properly care for the beautiful body you were given. You are treating yourself with respect. You are loving yourself. Once I started eating this way, my energy levels increased, my skin cleared up, I have more confidence, I am stronger and I feel more open and alive to the world around me. What more could you ask for! Your body is a sacred place and you should treat it as such. You are worth giving yourself the absolute best care, chemical free, nutrient full. Grow into the beautiful creature you are meant to become! Fellow vegans! Please comment with any other tips that work for you! There is more to being vegan than not eating meat and cheese products. In order to stay fit, have energy and eat clean, you also need to avoid an excess amount of sugar and gluten. If you rid your body of the toxins and hormones that meat and dairy fill it with, but then load up on bread and sugary snacks, you won’t see the change you are looking for, or feel the energy that eating fruit and vegetables give you. Sugar is an addictive substance. According to authoritynutrition.com, sugar contains the same addictive reactions in the brain as opiods. When we eat foods that contain a lot of sugar, a massive amount of dopamine is released in an area of the brain called the Nucleus Accumbens. When we eat these foods often and in large amounts, the dopamine receptors start to down-regulate. Now there are fewer receptors for the dopamine. This means that the next time we eat these foods, their effect is blunted. We will need more junk food next time we eat in order to get the same level of reward.Sugar and other junk foods, due to their powerful effect on the reward centers of the brain, function similarly to drugs of abuse like cocaine and nicotine. I was a sugar addict. I can’t even tell you the countless times I tried a no sugar/ no white flour type detox, years before I went vegan. The first few days were always awful. All I could think about was sugar. Chocolate, cake, candy, even juice, which I barely ever drank. My body wanted the fastest shot of sugar it could get and my mouth felt like it was actually salivating for anything sweet. When I made it through those moments and I felt strong enough to at least taste a piece of a Reeses if it was there, I would relapse and eat the whole thing. And want more. I still struggle with sugar cravings now, but not so much. Now that I have been filling my body with nutritious foods that make me feel good, I am less likely to reach for the bad stuff. That is not to say that when I’m standing in line at the grocery store and all the chocolate bars are staring at me, I still want to grab a handful and throw them on the conveyor belt. What keeps me from doing it though, is knowing that I’ll feel lousy afterwards. I’m finally at a place where I can eat a meal or a snack and feel satisfied and my stomach won’t hurt or feel bloated. So why would I want to ruin these good feelings? Fruit is a life saver. It is so sweet on it’s own that once I eat a banana or a handful of dates, I don’t feel the need for the chocolate anymore. However, I enjoy learning about ways to create “bad” desserts into healthy ones. I like the old habit of after eating dinner, having a dessert since I usually crave something sweet after I eat a savory meal. 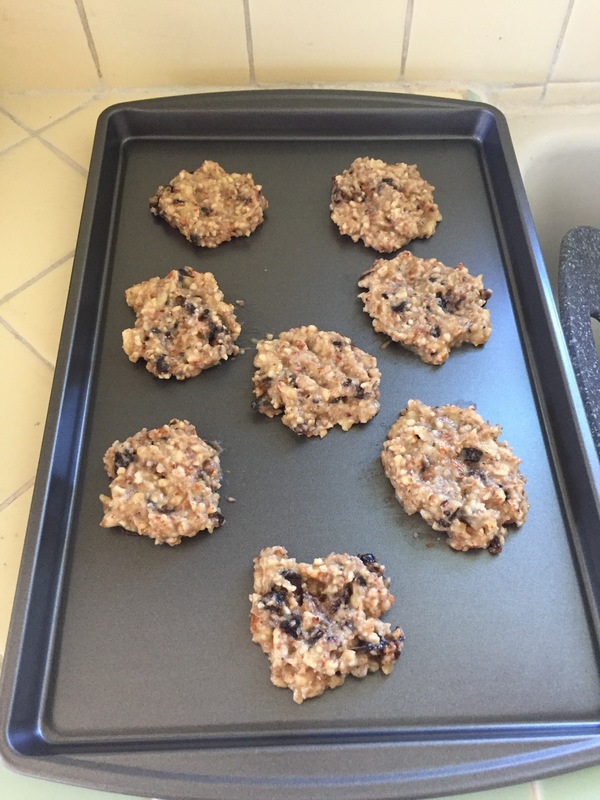 Here is my vegan cookie experiment! 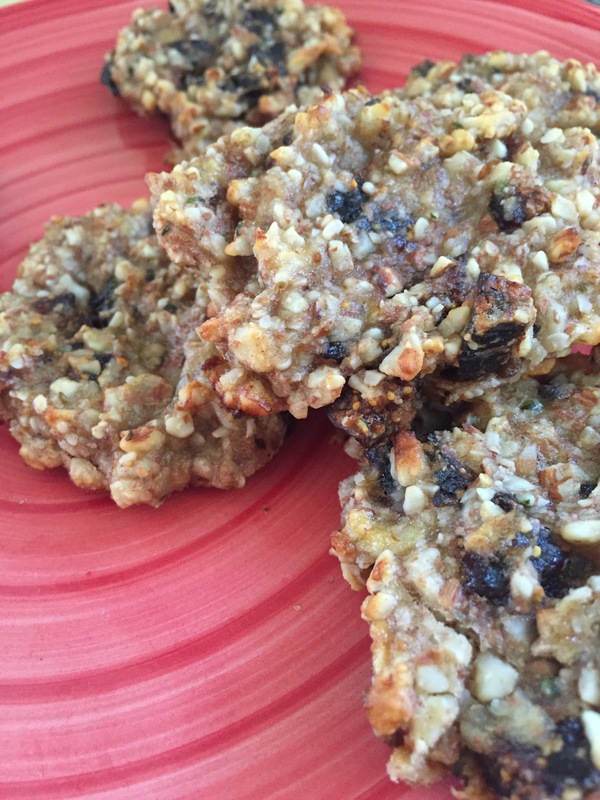 I am delighted to share this amazing cookie recipe from onegreenplanet.org. 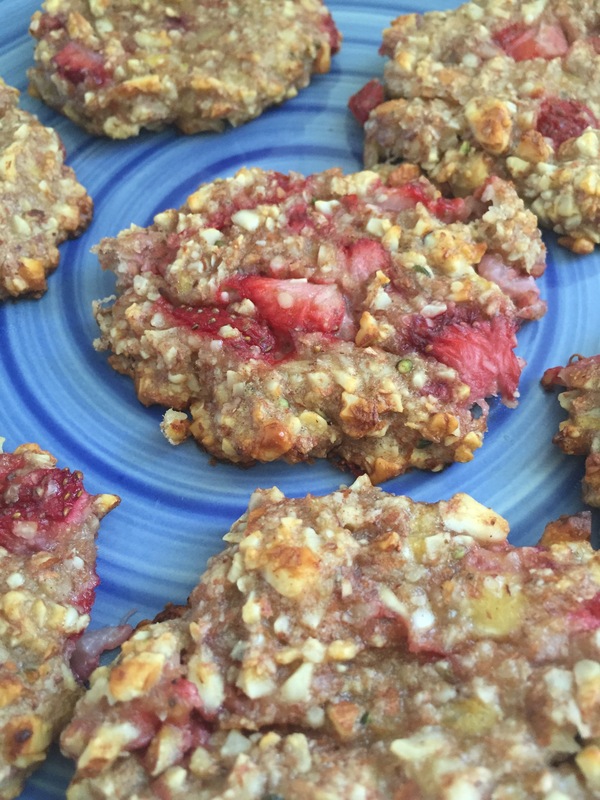 Contributor Lucie Javorska made these 5 ingredient banana fig cookies that I was so excited to try. I had never tried or cooked with cardamom before. Upon doing some research, I found that this ancient spice originating from India, Nepal and Bhutan, has a significant amount of health benefits. Cardamom helps with cholesterol control, cardiovascular issues, blood circulation, urinary tract infections and gastrointestinal protection. It is also very expensive so I ended up finding a small amount to purchase at Whole Foods, as I wasn’t sure if I was going to like it or use it after this recipe. Cardamom is a very strong and specific flavor but I wanted to follow this recipe exactly to get the full experience. I’m so glad I did! All you do is combine, 2 mashed bananas with ground up almonds, chopped dried figs, a little cardamom and some chia seeds. (I used hemp seeds because that is all I had). It’s amazing that ground almonds can make a delicious flour substitute and binding agent. The sweet bananas and figs left no room for me to miss white sugar. I ate four in a row after they cooled and there was no guilt involved. I was excited to find a simple and delicious recipe to make whenever I felt like I wanted some carbs. Because I loved these so much, I wanted to try my own version. I substituted the figs for slices of fresh strawberries and the cardamom for cinnamon. Cinnamon is also great for the cardiovascular system and digestive system, as well as a de-bloater. I baked them for the same amount of time and at the same temperature. 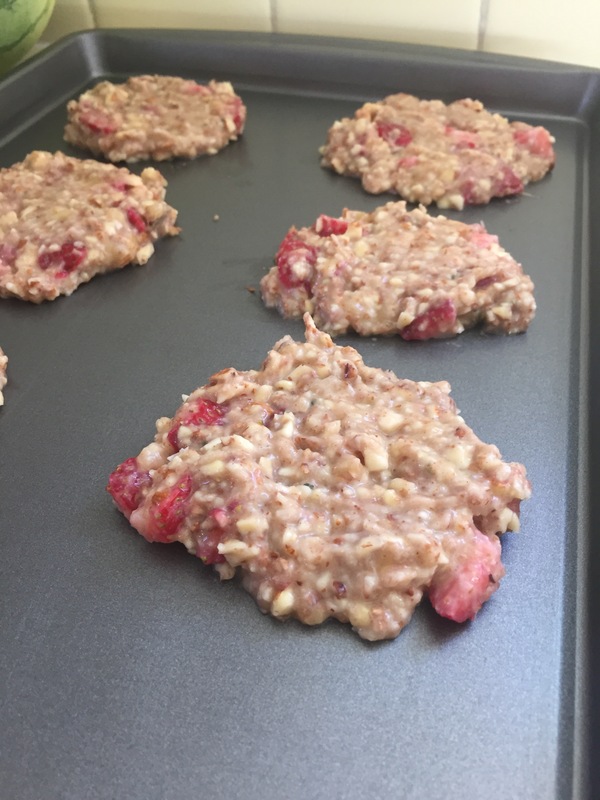 I love warmed strawberry desserts like strawberry rhubarb pie or a cobbler or warm tart, so this was a great way to get that strawberry sweetness into a cookie dessert. Thank you to onegreenplanet.org for posting this recipe! Comment below if you have any other vegan desserts I should try! Part of the joy of this lifestyle is coming up with creative ways to prepare your food. Since I don’t have the staples of a standard American diet, I have to think outside the box as a vegan to create delicious meals that still leave me feeling satiated and satisfied. In this series, I will show you what I have been eating throughout the day as I continue to experiment. Enjoy! I really enjoy starting my day off with fruit. It’s hydrating, sweet, filling and I don’t feel sluggish. I want energy to start my day and these healthy carbs will help me do that. Today, I drank two glasses of water upon waking up. I usually have a fruit smoothie for breakfast, however, on this particular day, I was really hungry and wanted something bigger. I decided to try my take on a smoothie bowl. I blended frozen bananas and frozen mango with a little almond milk to make an ice cream like consistency. Then I just chopped up a fresh banana and some raw cashews and sprinkled it all on top. So delicious and so filling! Sometimes, depending on how big my breakfast is or how I’m feeling, I don’t eat a proper lunch. I might have a small salad if I feel like I need some veggies, or I’ll snack on fruit or nuts throughout the day. There is a local farmers market within walking distance from our apartment in Long Beach and there is some of the best fruit I have ever had there. This is called a King Midas plum. I had only ever tasted the standard red or dark plum prior to coming to Cali because that’s all MA had to offer.This farm grows about 10 different types of plum, all unique in sweetness, color and texture. The King Midas is sweet through and through. Every time I bite into one, I can’t believe how juicy and amazing they are. I had one of these as a snack, along with a bowl full of green grapes and more cashews. I’m sure I ate a few dates at some point as well. Marty and I have been trying to get a little more creative when it comes to dinner. On the nights that we don’t go for a run, we usually prepare a good sized dinner. Tonight, I was craving tomato, but I wanted a cold dish, something refreshing. I decided to try a take on bruschetta. Next, I chopped up two big tomatos into sizable chunks and let them soak in the oil mixture. While I did this, Marty made noodles out of zucchini with our zoodle maker. Then, I just added everything together! This is a great meal if you are a fully raw vegan or if you are craving some Italian dinner like spices. These were amazing on their own, however, we had just discovered Sir Kensington’s Fabanaise (vegan mayonnaise) in chipolte flavor. It made an incredible dipping sauce! The good thing about this vegan mayo is that it is made with ingredients like sunflower oil and chickpeas, so there weren’t any hidden preservatives to make it taste like mayo. I hope you enjoyed this! Comment down below if you have any questions or recipes I should try! There are a lot of reasons why I decided to relocate myself to California. As I think about the chain of events that lead me here, I can’t help but feel as if everything fell into place exactly the way it was suppose to. In college as an English major, I wrote all the time. Short stories, essays, fiction, non- fiction…it was amazing. During this low point, the only writing I was doing was copying self help quotes into a composition note book. I was unhappy with myself as a person and how I had been treating my body, filling it with alcohol and fried food and pizza all summer long. Now that the warm weather was gone, and the dark, cold New England weather was fast approaching, I felt depressed for the first time in my life. In a nut shell, Cheryl’s story made me start thinking about what is actually important. What I actually need in life to survive.And in reality, its not very much! After finishing the book and wiping away the tears I shed (did I mention is was an emotional time for me?) I wanted to tear my room apart and throw away everything I had that was not essential to making me a happy and better person. The thought of minimalism and living on very little intrigued me. But instead of packing a backpack and hiking the PCT like Cheryl (although I can’t deny that I did consider this) I made the decision live simply. To me that was freedom. I felt lighter and I looked thinner. As some of you may know from eating clean, its addictive. I wanted to know what else I could be omitting or adding to keep my body feeling this good. I stopped eating meat. This actually wasn’t very hard for me. Ground beef and burgers usually caused me to have stomach pain, so I hadn’t been eating those much. Chicken was usually accompanied with some kind of cheese, as 1. I am Italian and 2. a lover of chicken nachos, so I wasn’t really eating much of that after I cut out the dairy. Then I just kept going. I found amazing gluten free bread. I started eating hummus and avocados, fresh fruit and veggies. Tabouli, green smoothies, dates, coconut water, black bean and rice burritos. All amazing food! I got to the point where I looked forward to going to the grocery store because I loved buying things that were good for me and delicious at the same time. I started taking turmeric supplements, a root rich in nutrients and anti-inflammatory properties for my skin. I also took a probiotic for my gut health and vitamin D (because of the already mentioned depressing weather of Massachusetts during this time.) Before I knew it, I was living a vegan lifestyle. And I loved it. He was the one that suggested we leave Massachusetts and start a life in California. At first, I thought he was joking, dreaming perhaps. But he was serious. I had been wanting to move out of MA for years. Having been to LA and surrounding areas a few times to visit my friend, I knew a little about Cali life. However, the thought of moving there on my own and leaving my family deterred me. But it felt right when Marty said it, like it was finally the right time. We spent the next few months forming plans. Marty’s friend and roommate grew up in Long Beach and was looking to go back as soon as possible. He helped us a lot, mapping out our road trip route and trying to prepare us for this huge change. We felt like we were ready. MA isn’t a terrible place. It’s beautiful in the summer and it will always be special because it is my home state. However, it’s winter the majority of the time. That means no sun, no running along the beach, no fresh produce, no yoga in the grass, no walking from place to place. All the things I longed for. So we left. I got rid of everything I had except for two trash bags of clothes, a pile of books and my record player. And we loaded it up into the car and drove away. Stay tuned for part 2 coming soon! If there is anything, you want me to elaborate on, please leave me a comment!